At SendGrid we love our customers and I personally love Taco Bell. So it makes me proud to say that we power the email receipts of Taco Bell’s new mobile application! I thought I would let my colleagues take a break and I’ll take on the hard task of reviewing Taco Bell’s new app. I know, its a tough job, but somebody has to do it…right? In this post, I’ll go through how it works, my order experience, and some tips on how best to use it. At the end, I’ll also challenge my fellow developers to get creative by creating their own SendGrid/restaurant mashups. One of the most compelling reasons to order from the application, is the ease of customization. Prior to using the app, the most I’ve customized my meal is with different sauce packets. However, with the application I can now easily customize the type of protein as well as add on extra goodness. In addition to the ability to optimize your selections for maximum taste bud impact, the app lets you cut the line…at least it felt like I did. 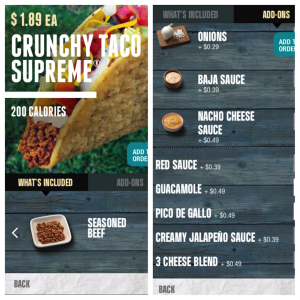 As soon as I arrived at my local Taco Bell, the app notified me to hit a button and notify them to start creating the order. I selected “In-Store Pickup” and within a minute or two of entering, my name was called. Pro-Tip: Use in-store pickup if you can. It feels like you get put ahead of everyone else waiting in the store, plus you get access to the sauce packets. Take a handful! Finally, I thought I would “spice” things up with a fast food challenge. 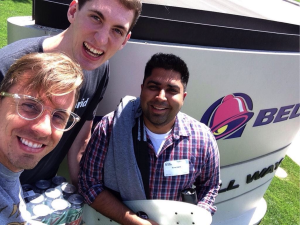 Last May I entered a Techcrunch Disrupt Hackathon and created a Taco Bell inspired hack. It turned out to be an amazing experience that let us start a conversation with Taco Bell. The top 5 restaurant/SendGrid mashups get a $25 gift card at the restaurant of their choice. (Take a look at our Parse Webhook for ideas–there are no restrictions on what you can code.) This expires on March 31st. You can enter as many times as you like, but can only win once. Email your hack to kunal@sendgrid.com.